You can make baguette at home with this 3-well non stick French Bread Tray. You can make 3 loaves in one time. The perforated design let air to circulate around loaf bread to creat a good crust. The non-stick Coating is food safe and easy release and clean. The temperature for the pan is up to 446℉. Washing Note:Don't use the abrasive Brush to clean the pan. Not For microwave oven use. Remarks:The color will be a little different because of photograph and monitor. 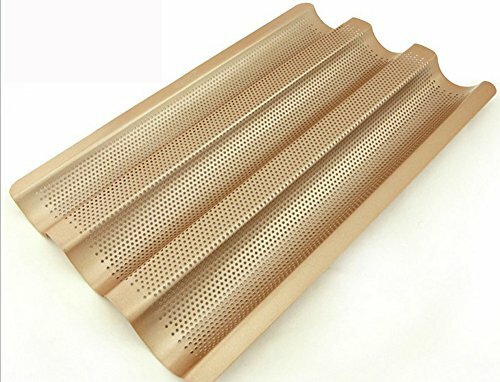 3 slot french Baguette tray perforated design is good for baking. Made of Heavy Carbon Steel and Food Safe Non-Stick Coating. Excent Heat Conduction and Gold Color for special finish. You can make French and Italian Bread Baguette at home . If you have any questions about this product by Monfish, contact us by completing and submitting the form below. If you are looking for a specif part number, please include it with your message.